Nikolai learned how to make these energy bites from his gifted and talented class at school. He requested to make them at home so we got the ingredients yesterday. Here is the recipe we used. I included some in his dinosaurs bento lunch today. In a bowl, begin mixing the SunButter and honey together. Add the oatmeal and flaxseed and continue mixing. Combine the chocolate chips and raisins. Continue mixing all of the ingredients thoroughly. Chill the mix in the refrigerator for 1/2 hour. Once chilled, remove from refrigerator and roll into balls of whatever size you prefer. Store in an airtight container and keep refrigerated. I am sure ours will be gone in a couple of days at most; they are so yummy!! Note: Feel free to substitute the ingredients above or add more to your liking. I have seen recipes using coconut flakes, almonds, pecans, sunflower seeds, walnuts, dried fruits, vanilla extract and more. 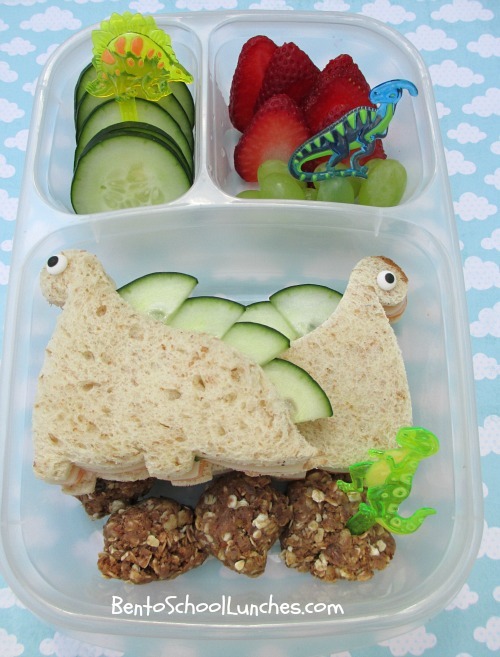 Dinosaur shaped whole wheat sandwiches with icing eyes and cucumber slices plates on back. No bake energy bites as stones below dinosaurs (recipe above). Yum! This lunch looks so fresh and tasty, I'd happily eat it. Love all the dinosaurs! Adorable dinos! I love the cucumber spikes! Super cute, Rina! I love that you and I both had dinosaurs on the brain today! :) The cucumber is awesome!!! Thanks so much Venia for your kind comment! :) Great minds think alike and I love that! Cute lunch and thanks for the recipe! Thanks so much Kathy! :) We doubled up the ingredients and I am glad that we did, I can't stop eating them! Loving those dinosaur spines.. what a great way to make them extra special! Congratulations! This is featured over at Bento Blog Network today!